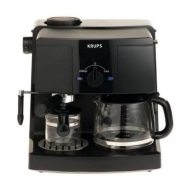 alaTest has collected and analyzed 50 reviews of Krups XP1500 Coffee and Espresso Combination Machine, Black. The average rating for this product is 3.5/5, compared to an average rating of 4.4/5 for other products in the same category for all reviews. Opinions about the noise and size are on the whole positive. The capacity and price also get good comments, whereas the reliability and durability get critical opinions. Reviews are divided on the maintenance. We analyzed user and expert ratings, product age and more factors. Compared to other products in the same category the Krups XP1500 Coffee and Espresso Combination Machine, Black is awarded an overall alaScore™ of 78/100 = Good quality. This unit works well. Fast and quiet. Great product for the price. Try it! Krups is the best coffee maker ever!